She asks and she receives (well, not always). 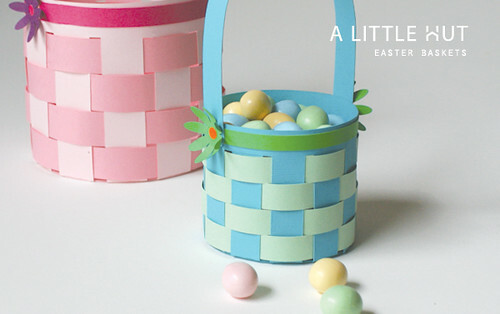 My little C has seen the Easter decorations pop up everywhere and she mentioned that I should make an Easter basket. Hmm... why not? So, here are the Easter baskets that I'll be using for little treats. We use big real woven baskets for our Easter egg hunt but I like giving them something a little extra so these baskets will be perfect. Speaking of an Easter egg hunt. How old where you the last time you participated in one? I was surprised that both the kids said they'd like to have one even though I was almost sure our DS would turn me down. I'm so glad that we still have interest in innocent fun. How long will it last? Remember that there is a 20% discount in the shop until March 12th! Add the code craft2012 in the Shopping Cart page. I'm still in the running for Top 25 Creative Moms can I get your votes? You can vote once every 24 hrs. until March 15th. I'm so close to the top 25 but I still need your help. If you have a second, please vote here. Thank you!